This holiday season is going to be a big one! According to the National Retail Federation, online sales this season are projected to increase 7-10% to as much as $117 billion. 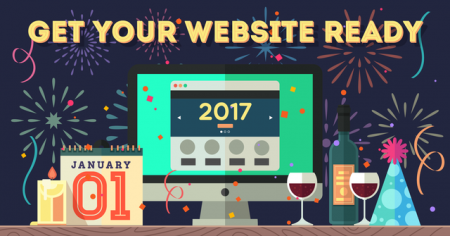 With this increased forecast, will your website be ready for this upcoming holiday season? If not, don’t fret and read on to find out what to look out for to have your website ready for the holiday season! What does mobile-friendly even mean? To be mobile-friendly basically means that your website can adjust itself to display on different size screens, based on the device used to access your website. Many are projecting that mobile-commerce will make up 40% of the U.S. e-commerce market by 2020, so you definitely don’t want to fall behind in the movement to a mobile-commerce future. During the holiday season, people are often at their busiest. With the task of holiday shopping, people want to get their shopping done as conveniently as possible. If your website is not mobile-friendly, you risk the chance of your customers abandoning your website just because they are frustrated that your website will not properly display on their smartphone or iPad screen. Let’s face it, not all of your customers will have time to sit in front of their computers to shop, so you should definitely take that into consideration. The time it takes to get from one page to another on your website is extremely important to a user. It is reported that 44% of shoppers would cancel their online orders mid-way just because of a website delay. With holiday sales and events like Cyber Monday, traffic on your website will be at a seasonal high, so making sure your website is running at optimal speed is essential. If your website is operating at optimal speed, it is more likely your customers will be able to explore your entire website. When customers can see everything you have to offer, you greatly improve the chances of making sales. One of the first things to look at if your website speed is slow are the images on your website. Images on websites should ideally be 72 DPI for a better loading time, anything higher will hinder your website speed. Another thing to check are your extensions. Having excessive plugins/extensions on your website, even if you aren’t using them, will still slow down your website. When your customers load your website page, they are loading all those plugins/extensions as well, no matter if they are working or not. Staying on top of your website speed will allow your customers to have a better experience on your website and reduce the need for them to contact you about issues. Nobody wants to wait 10 minutes for a product page to load, right? Aside from just getting the back end of your website ready, you also need to get the front end of your website ready for the holiday season as well. Start by promoting your sales on your website before the sale begins. It is reported that 74% of shoppers are influenced by coupons and offers online. If your customers are aware of the sales available on your website, they will be more likely to visit your website during the sale. It’s also important to promote your sales early because a large majority of shoppers tend to research what they want to buy before actually buying it. Another thing to take into consideration when you promote is to offer free shipping and easy return policies. An average online shopping spends about $380 on Black Friday. If you can help your customers cut down their costs, like offering free shipping, it’ll entice them to shop on your website rather than on a competitor’s. After all, around 93% of shoppers take action when there is free shipping on their purchases. During the holiday season, shoppers tend to be buying gifts for others. Buying online is risky for customers, especially if they are buying online for others. To offer a solution for your customers, offer flexible return and exchange policies in case something doesn’t turn out the way the customer expected. Being helpful and reassuring to your customers will leave a good impression and likely turn them into a returning customer even after the holiday season. Getting ready for the holiday season is all about expecting problems and solving them before they become actual problems. Put yourself in your customer’s shoes and think about their experience on your website. From there, you will be able to see where problems lie and solve them so your customers can have a user-friendly experience while shopping on your site. Problems with mobile-friendliness and loading time can be big issues that hinder a customer from having a good online shopping experience and promotions can make or break the interest of your customer on your products. These three points are just a few highlights that should definitely be looked into if you want your website to be ready for the holiday season, but there are many more points that can and should be looked at. If you need some help, we have a team of in-house developers that would love to make your business website ready for this holiday season. Contact us or call us at 626.400.4511 today!